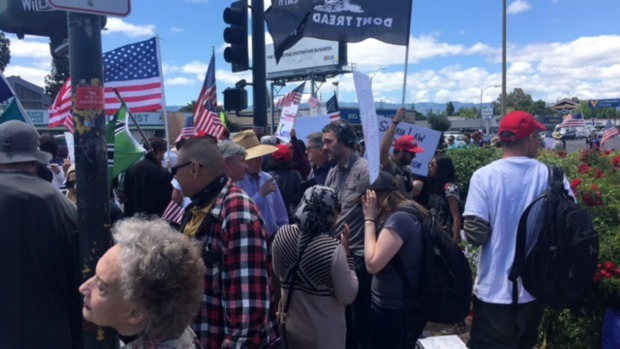 Two battling political groups on Saturday converged on Santa Clara to hold demonstrations right across the street from each other, and despite competing interests, the scene remained fairly peaceful. Christie Smith reports. 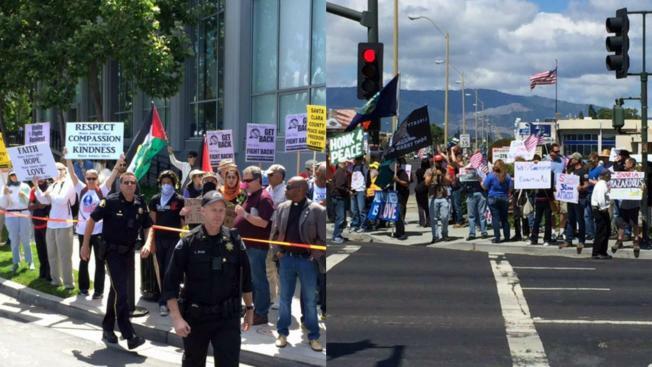 Two battling political groups on Saturday converged on Santa Clara to hold demonstrations right across the street from each other, and despite competing interests, the scene remained fairly peaceful. 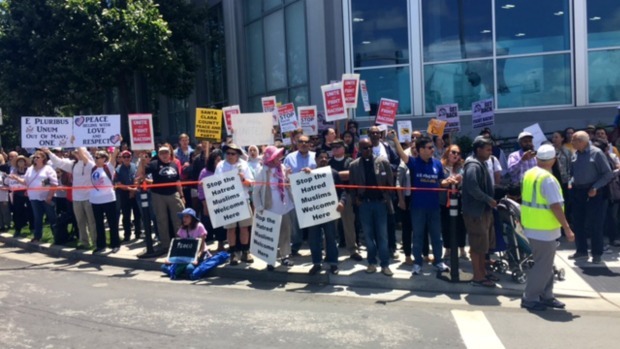 NBC Bay Area was first to report about the protest march, which was held near the Santana Row Shopping Center and focused on a debated Muslim law. Act for America — one of the sides on display at the event — has been labeled an anti-Muslim hate group, a description the group emphatically denies. The group said it was protesting parts of Muslim law known as Sharia law, which it said leads to abuse of women. But the nation's largest Muslim American group, CAIR, said the march was really to promote hate. 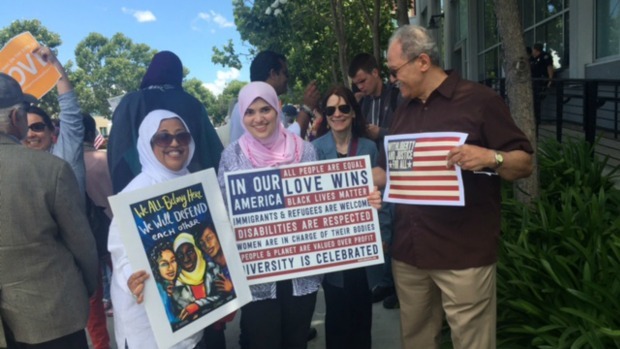 CAIR, along with 75 other community groups, staged a counter-protest against Act for America. "They're saying that they're marching against Sharia, but that is code for marching against Muslims," Zahra Billoo, Executive Director for the San Francisco Bay Area CAIR Chapter, said. "No one is attempting to implement Sharia law in the United States, let alone in Santa Clara or San Jose. For folks that don't know, Sharia is code of conduct, a guide for life that comes from the Quran." Opponents such as Morgan Jones, who says he isn't against Muslims and voiced frustration with people calling Act for America anti-Muslim, is worried about the Muslim law. "I know it's not here yet, but if you look at Europe, it is there, big time," Jones said. "I mean, it really is there. You got Sharia courts, you got parallel societies, you have "no-go" zones." More than 100 organizations sent letters to the mayors of the 29 cities around the country where marches were planned. The letters requested mayors to "disavow" the marches. Santa Clara and San Jose police boosted staff and said they would monitor the events to prevent confrontations and violence. In the wake of recent events happening locally, nationally, and internationally, we, at the City of Santa Clara, would like to reassure our community that we stand in solidarity with those who have been the targets of discrimination and bigotry. The City of Santa Clara strongly opposes all forms of discrimination and will not tolerate hate crimes. It is the commitment of the City of Santa Clara that it does not discriminate on the basis of ethnicity, religion, ancestry, national origin, disability, gender, or sexual orientation. The City of Santa Clara is devoted to promoting the public health and welfare of all who live and work in our city, and has policies in place to protect and safeguard the right and opportunity of all persons to be free from arbitrary discrimination. The Santa Clara Police Department is dedicated to the highest professional standards when investigating hate crimes to ensure that offenders are held fully responsible for their actions. Our community is stronger and united when each person is treated equitably, and we will remain committed to ensure that everyone will be accorded with equal civil rights and civil liberties.